Fresh from a comprehensive renovation, Sheraton Jacksonville welcomes travelers to northeast Florida with spacious accommodations, gracious service and excellent amenities. Benefit from our proximity to local points of interest like downtown Jacksonville, the St. Johns Town Center and an array of top golf courses or spend a day soaking up the sun on Jacksonville's pristine beaches. Settle into your modern, well-appointed guest room and enjoy elevated perks like complimentary Wi-Fi access and our Sheraton Signature Bed. Savor vibrant, all-day dining at Bold City Grill, break a sweat in our Sheraton Fitness Center or get connected in our Link@Sheraton business center. Sheraton Jacksonville offers a variety of meeting and event spaces. Our talented event and catering team will handle every detail of your event enabling you to relax and enjoy a productive, successful event. Whether you're traveling to Jacksonville for business or for pleasure, the Sheraton Jacksonville Hotel is an inspired choice. 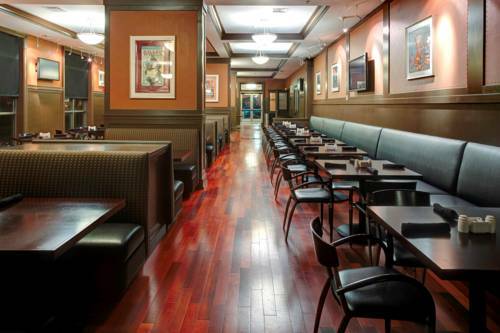 Bold City Grill: Bold City Grill's casual and energetic atmosphere is complemented with dark wood, granite topped tables, high impact bar and flat panel TVs. Enjoy delectable cuisine featuring everything from gourmet salads and burgers to fresh specialty fish.